I was really looking forward to seeing September Mourning as it was their first visit to Seattle. Having been a fan of the band for a long time, the anticipation of the gig at Studio Seven was running high for me! As the first trans-media project between band, music, and comic books, the band has all the ingredients to become a huge success. Visually stunning on stage, the involvement of Marc Silvestri's Top Cow Productions on the comic book side, and most importantly, the music to back it all up, September Mourning took the stage on Friday night full of atmosphere and wonderment. 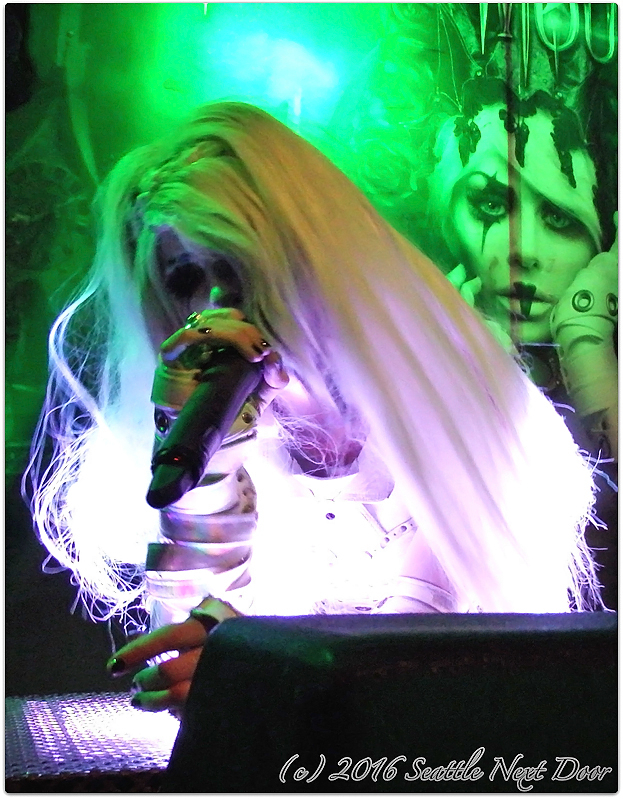 The audience was definitely filled with September Mourning "Children Of Fate" as their fans are referred to. As the band took the stage, even if you were unfamiliar with the band, you couldn't help but take notice of such a unique presence on the stage. 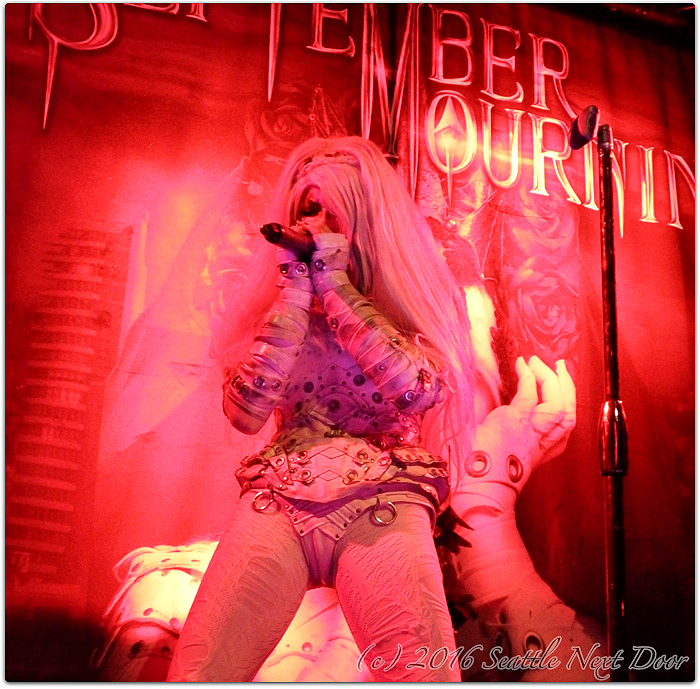 Fronted by September, half reaper/half human, and backed by the four Reapers (Riven, Wraith, Shadou, and Stitch), September Mourning took the audience on a journey into their dark world of Fate. 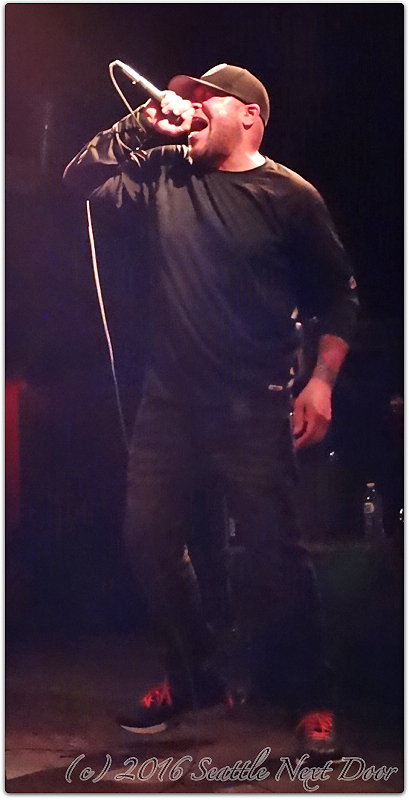 Their set was tight, ending with current single, "Eye Of The Storm", but all too short. 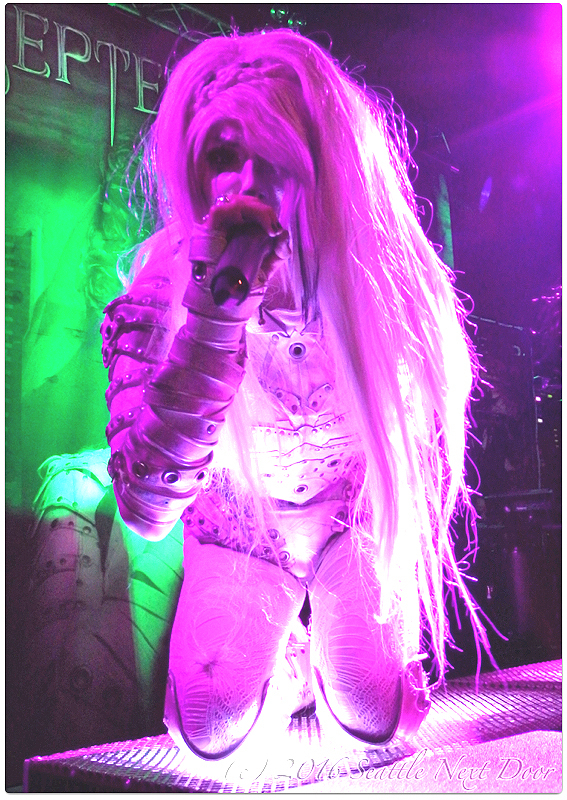 At one point, September walked off the stage and down into the photo pit to sing and talk to the audience. The audience at Studio Seven was clearly into the band's performance. 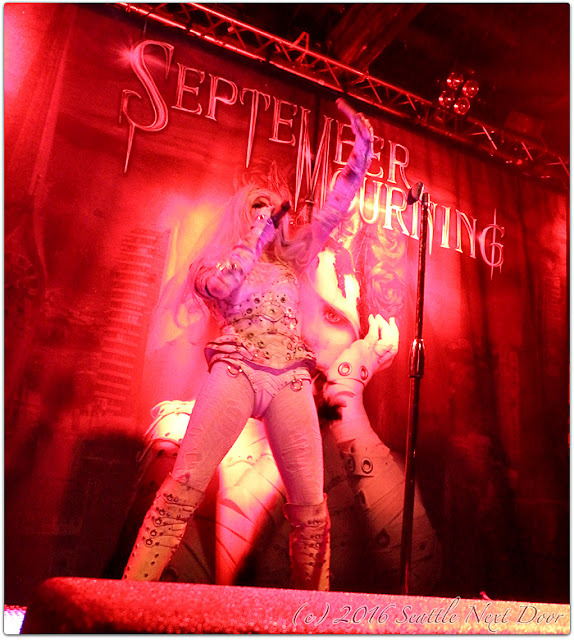 Those unfamiliar with September Mourning before the show were now converted Children Of Fate. This is a band that, again, has all the ingredients to take it to the top. Catch them on tour when they play your town! They are touring throughout May and beyond. Check out their website to learn more about their history and the story thus far with many more chapters to be written! The Devil I Know - Devil You Know Gig Report April 19th, 2016! 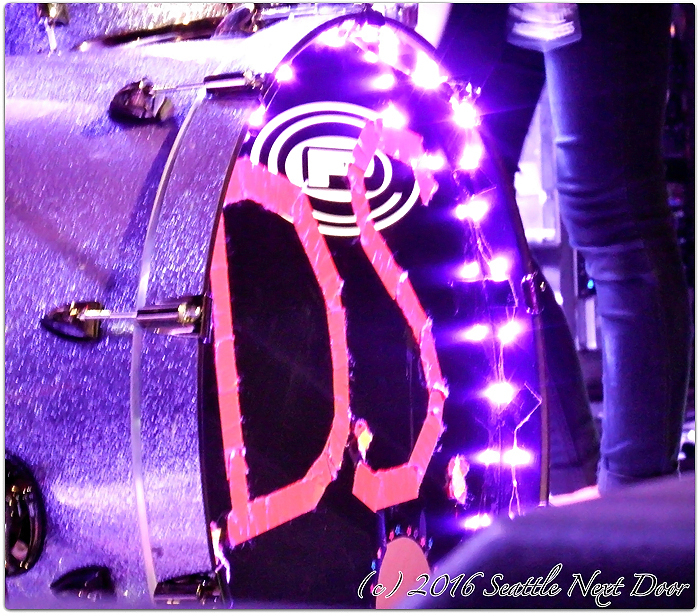 It was a Tuesday night in SODO. 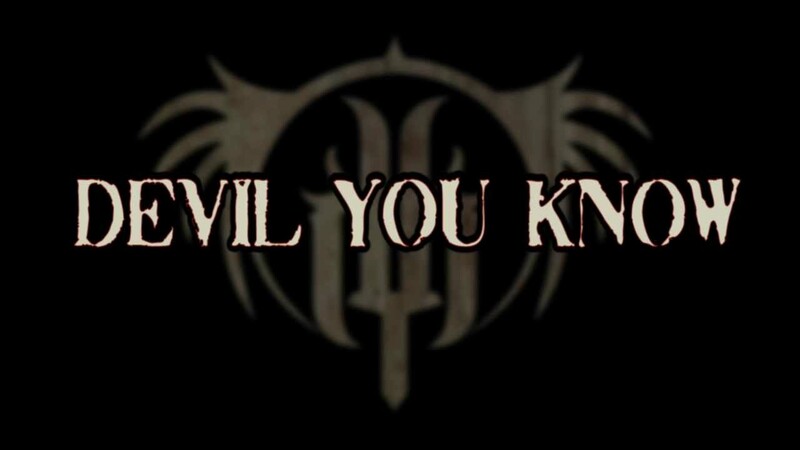 Devil You Know were on their first headlining tour of the U.S. dubbed "Make America Metal Again" with Canadian progressive metal band Oni as support. Oni is a six piece band from Canada. This was the first tour of the U.S. As the band got ready to play their set, I noticed a six string bass and an eight string guitar. A xylo-synth as well! Having only heard one track from the band's new website, I wasn't exactly sure what I was in for other musicians music. Oni are an interesting mix of many styles of metal. Vocally they're in the metal-core realm for sure. Musically they are progressive, technical, yet punishing in parts. A real eclectic (you knew I had to say it) mix of musical influences on display at Studio Seven on Tuesday night, Oni are rather original. I mean how many bands sport a xylo synth player?! 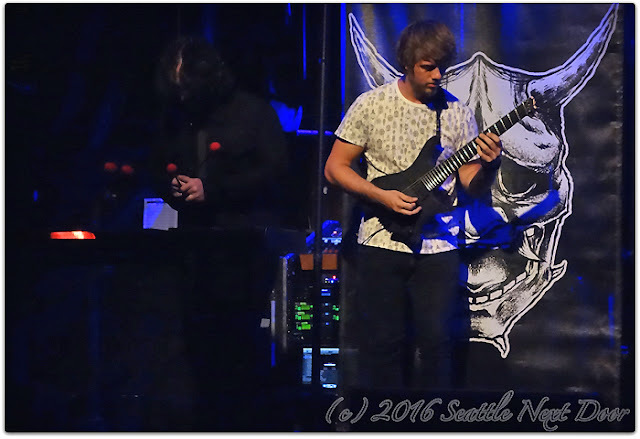 As a relatively new band on the scene, these guys need to get on a bill of more progressive metal to grow their fan base. Their was a stark contrast between their music and the headliner's. A great first effort by Oni! Metal-core headliner Devil You Know were on tour supporting their second album, "They Bleed Red". 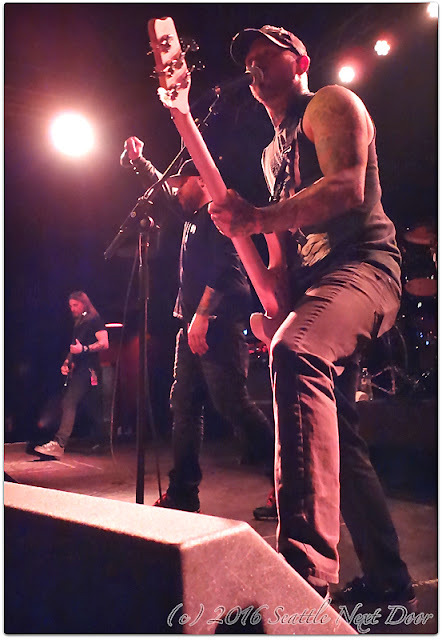 Featuring ex-Killswitch Engage singer Howard Jones, the quartet launched into a tight ten song set featuring tunes from both of their albums. Howard looked good and sounded better. Having parted ways from his former band for reasons made public, there were questions about his health and overall state of being. The answer on Tuesday night was that Howard is back - no question about it! The band was tight (even with a fill in drummer for this tour), professional, and punishing. 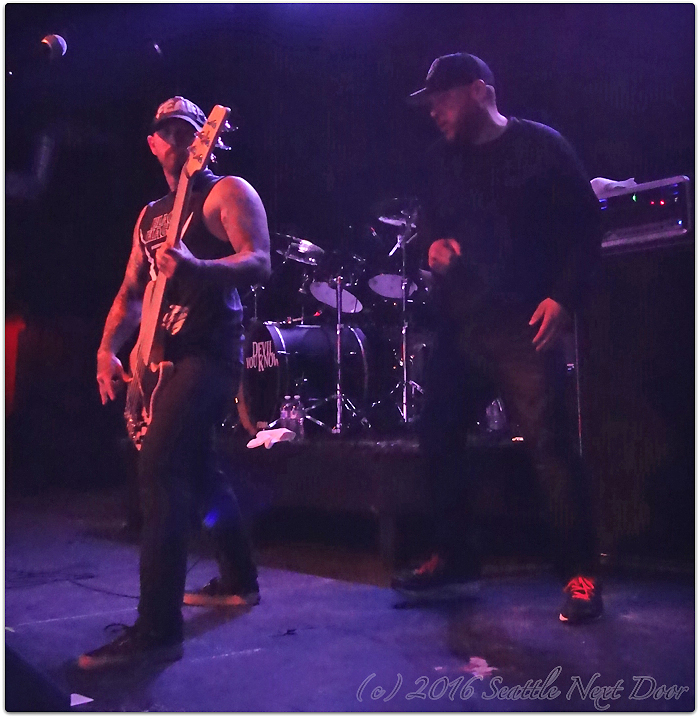 While I'm not a big fan of the genre, Devil You Know delivered the goods and the diehards that showed up to Studio Seven got to see a killer band in a very intimate setting. 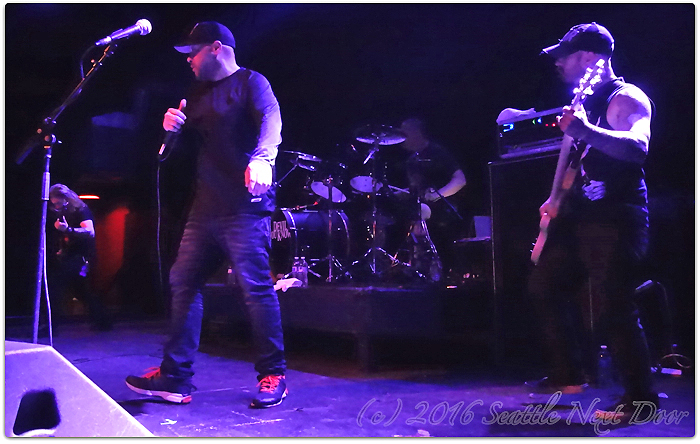 The band continues their tour before joining up with Hatebreed for another round of dates. Catch them when they hit your town! 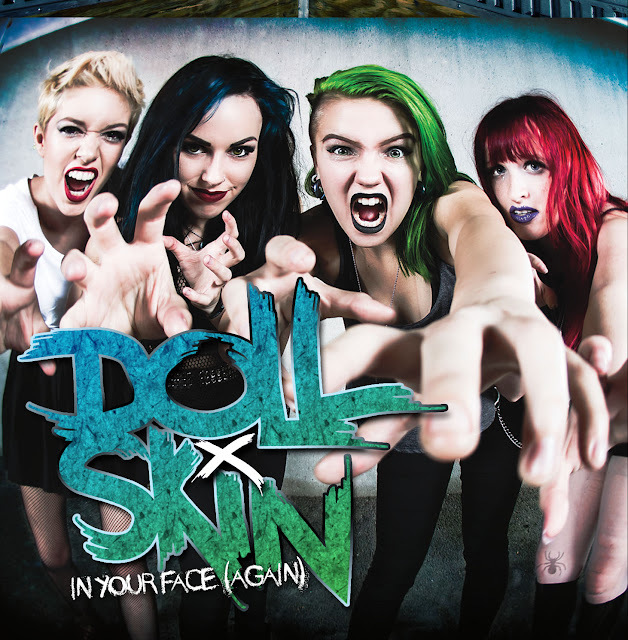 DOLL SKIN - In Seattle's Face - Gig Review! 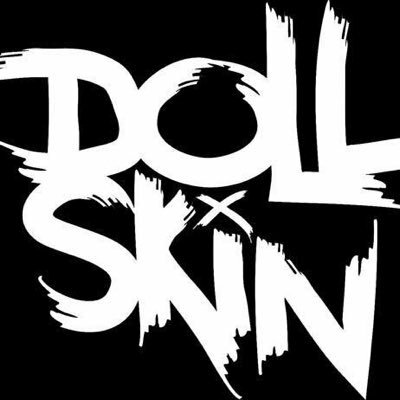 Doll Skin have been making a buzz as of late - partially based on their age and partially based on the involvement of Dave Ellefson (of Megadeth fame). Neither of these factors is fair to the band as Doll Skin ripped up Studio Seven on Friday night. Every young band (teenage years) faces the same criticism that they're a novelty act. That their age, or also in this case, being an all-female band, is the only reason they're getting attention. The audience on Friday was witness to a band that played well beyond their years. Touring in support of their release, "In Your Face" (recently re-released as "In Your Face (Again)" with extra tracks and new artwork), the quartet played a highly entertaining and energetic set. 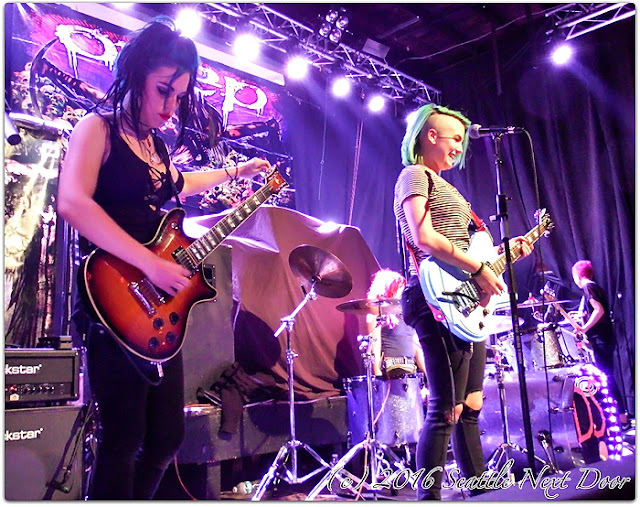 Based out of Phoenix, Arizona, the band consists of Meghan Herring (drums), Sydney Dolezal (vocals), Nicole Rich (bass), and Alex Snowden (guitar). 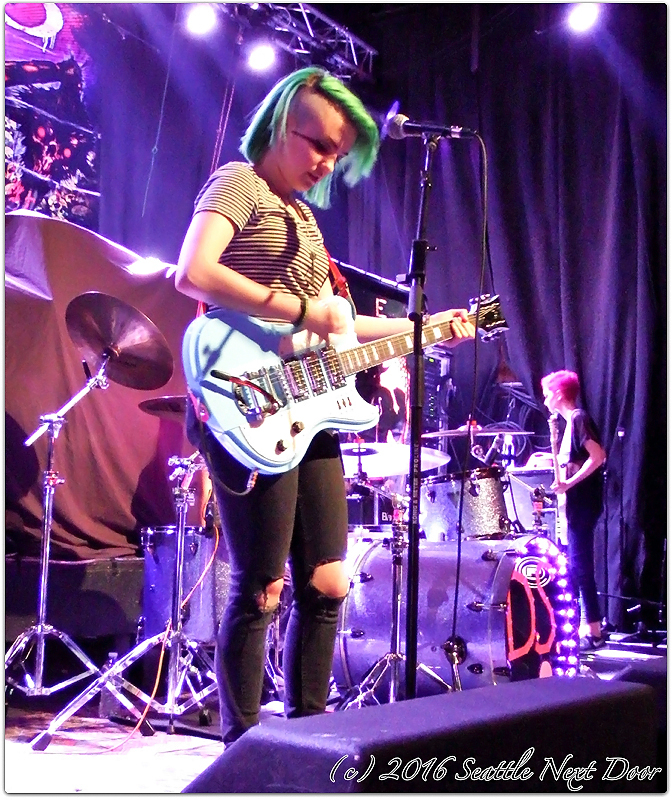 Sydney, in particular, really commanded the stage during their set. I found myself thinking how can someone so young perform on such a high level? 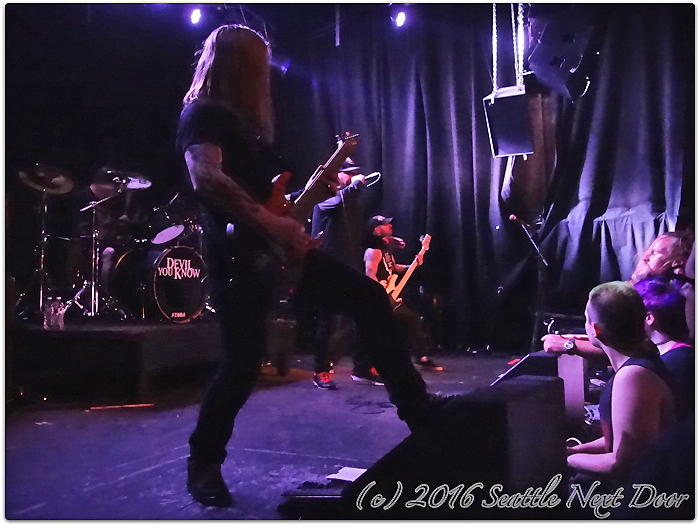 The potential that Dave Ellefson saw early on was very apparent watching Doll Skin perform at Studio Seven. Describing their music as only punk is doing it a disservice. It's definitely punk influenced but there are elements of rock, pop, alternative, and even a bit of metal in Alex’s guitar playing. I got the feeling watching the band play that I was watching a band that will be on the rise for years to come. I'm highly interested to see what the future brings. If Doll Skin hits your town, do yourself a favor and go check them out! It was fourteen years ago that Immortal played the Graceland (now El Corazon) as special guests of Manowar. They were one of the few black metal bands I had seen that were really good live. Unfortunately, they split up not long after that gig. 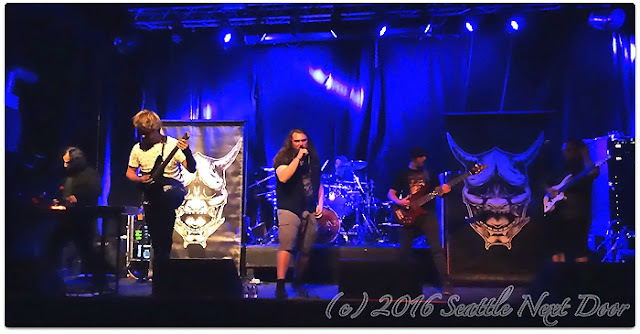 They reunited and recorded, "All Shall Fall". The band split up again - with Abbath going solo. Depending on who's version you read, Abbath has maintained that he wanted to continue with Immortal. Demonaz and Horgh state otherwise. They are continuing on as Immortal with a new member replacing Abbath. 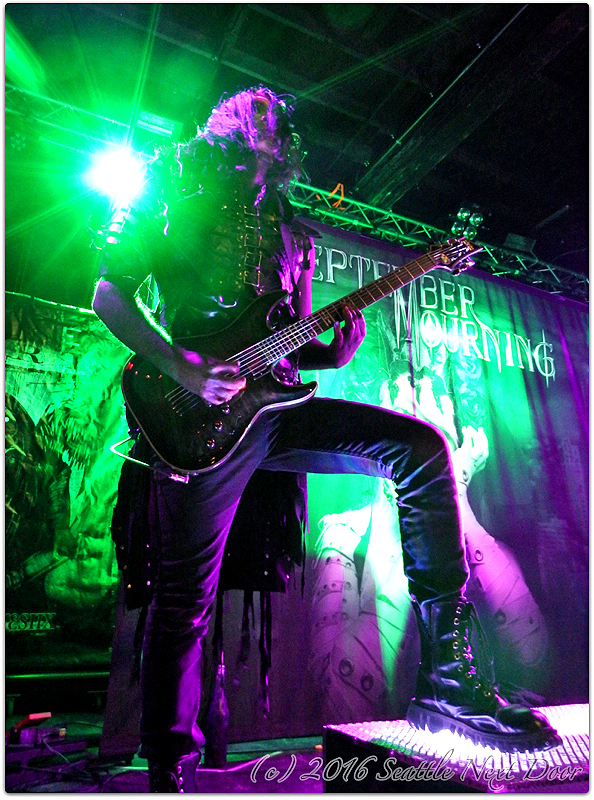 At the end of the day, I was happy to see Abbath was coming back to Seattle, WA as a part of the Decibel Magazine tour. Sharing the Skeleton Witch drum kit, Sweden's Tribulation took the stage around 7:30pm. 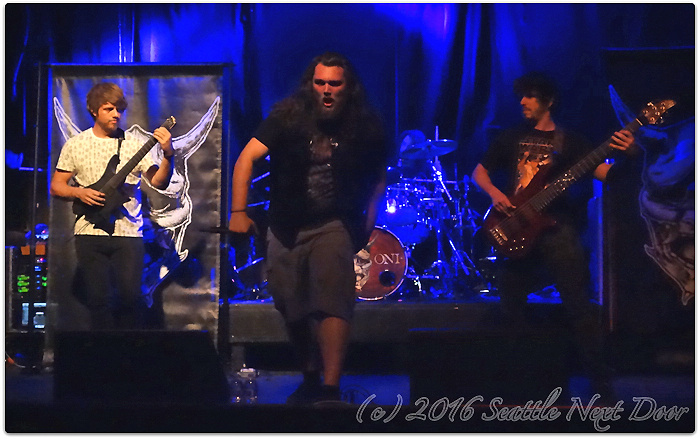 Playing an atmospheric style of black metal, the quartet got a good response from the half capacity crowd. Adorned in corpse paint, the band's thirty minute set was a good warm up for what was to come. By the last song of their set, a pit had started up - one that wouldn't stop for the rest of the evening. After a brief change over, Skeleton Witch took the stage. Their brand of metal - a mixture of all sorts of styles of metal - was well received by the denim vest/patch wearing fans. The band was a bit sloppy in a good way. Their new singer screamed his lungs out throughout their set. Also limited to thirty minutes, Skeleton Witch whipped the crowd into a frenzy. As the stage was cleared of High On Fire's gear, the lights dimmed, the fog machines were turned on, and the stage lights created the atmostphere for Abbath to take the stage. With their new drummer and guitarist, Abbath and King Ov Hell blasted through many cuts off the self titled album, "Abbath". 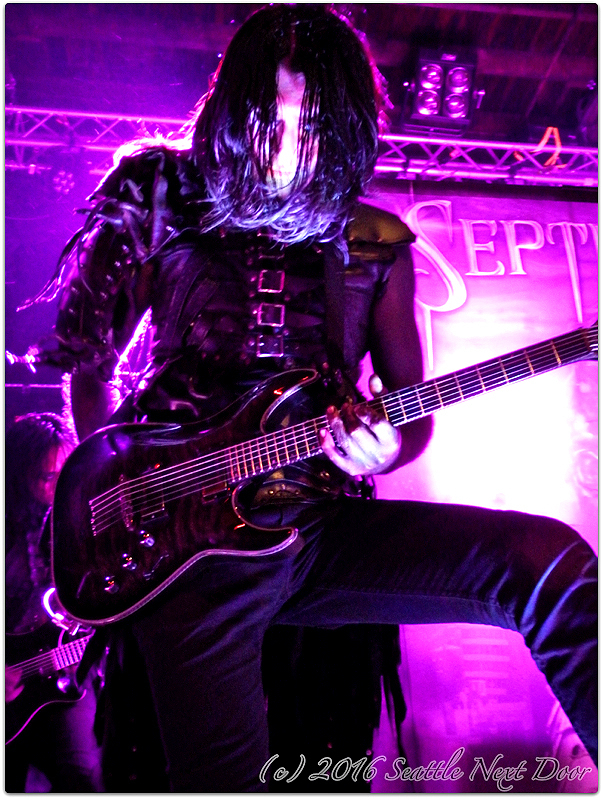 Sprinkled throughout were Immortal tunes such as "Nebular Raven's Winter", "Tyrants", "One By One", "In My Kingdom Cold", and "All Shall Fall". One tune from the side project I was performed as well "Warriors". Abbath clearly has a stage presence and he commands the stage. He would interject a dry sense of humor into his inbetween song banter with the audience. King Ov Hell was a great partner in crime on the bass. Creature (#2) on the drums played a very tight kit - much of which sounded like triggers. My only gripe would be the second guitarist. While skilled, he barely moved. No headbanging when Abbath and King were headbanging to their music. He looked really out of place on stage. This needs to be remedied. No encores as the band played a twelve song set - omitting "Solarfall" which has been played in many cities on the tour. The soundtrack to "Conan" blared over the PA as the house lights came back on. My overall impressions were favorable of all four bands. It was a diverse mix of metal that somehow worked. As much as I enjoyed High On Fire's set, I don't know if they fit on the bill. They can easily headline their own shows like they normally do. Their fans would have been happy seeing them play with bands of a similar style I believe. And for the Abbath fans, if they had another black metal type band on the bill, it would of made more sense. But it was the Decibel Magazine tour so there may have been strategy in place to cover different types of metal to bring in a wide array of metal fans. In any event - no April Fool's joke here. The bands were all business on Friday night. Do yourself a favor and check out the tour when it hits your town! Thanks to: Enrique at Season Of Mist for the opportunity! I saw Queensryche at the same venue in 2012 before the self-titled album was released. I, like many fans, came back to the band once Todd joined. The early years of the band are untouchable. No fan would dispute that. The latter years of the band are debatable. I can only speak for myself in that I lost interest with each subsequent release throughout the 2000's. The band I once loved had transitioned into something I didn't even really recognize as Queensryche. With the addition of Todd, the band found a new life and acknowledged their roots while staying relevant in today's music scene. The band sounds reborn. The show was sold out - a homecoming show for the band (even though Todd still resides in Florida). No opening act. The band has been out on the road promoting their latest album, "Condition Human". A video system has been implanted to compliment each song in the bands set each night. 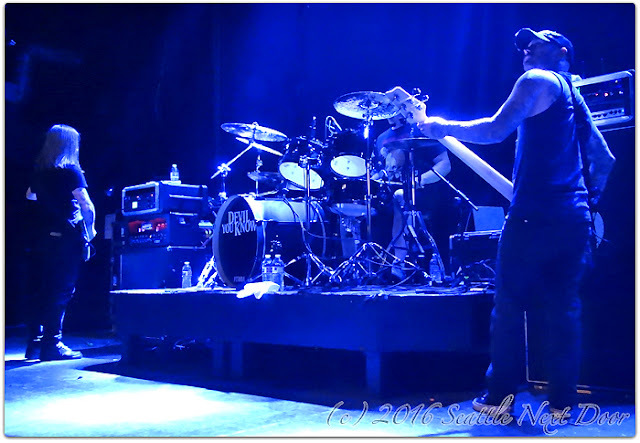 With the opening video images, drummer Scott Rockenfeld took the stage with a flashing miners hat on. The video screens introduced each band member - Scott, Whip, Parker, Eddie, and Todd. I liked the introduction bit. It was a nice touch to get the crowd focused on the fact that THIS is Queensryche. 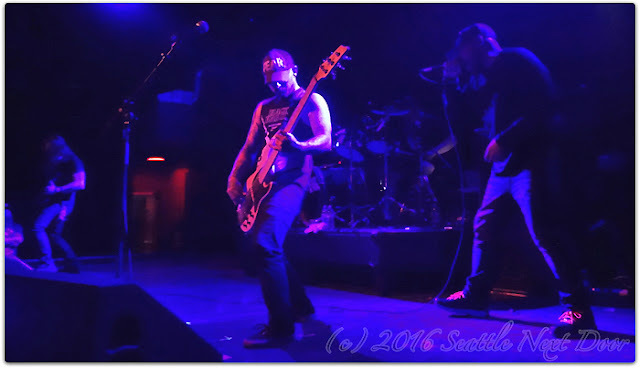 Launching into "Guardian" off the new album, the band has really come together on stage. All the shows they've been playing over the last four years have created a tight, cohesive unit. Playing a new set list of tunes, they played a great mix of old and new. From "The Mission" and "Screaming In Digital" to new classics like "Bulletproof" and "Eye 9", the band played like a well-oiled machine. Todd has found his niche. He will always be compared to his predecessor (who hasn't sounded like his early self for well over a decade), scrutinized when he deviates from the original recordings and blamed when he sounds too much like the original material, his true singing voice is starting to come out which is a great thing to hear and see. At this point, I'd like to think either the fans are with this version of the band or not. So, knowing that, I say be the best singer you can be and damn the critics and the naysayers. 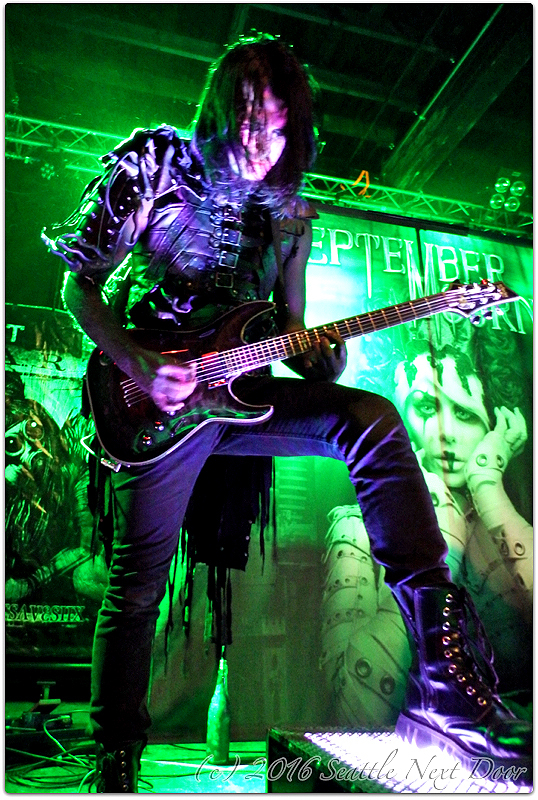 Whip has become the lead guitarist in the band. This has been the case since DeGarmo's departure. Back then, it may have been out of necessity or even convenience, but today that shouldn't be the case. Parker can play! I'd love to see more of a balance where he plays more of DeGarmo's old parts instead of Whip playing them. 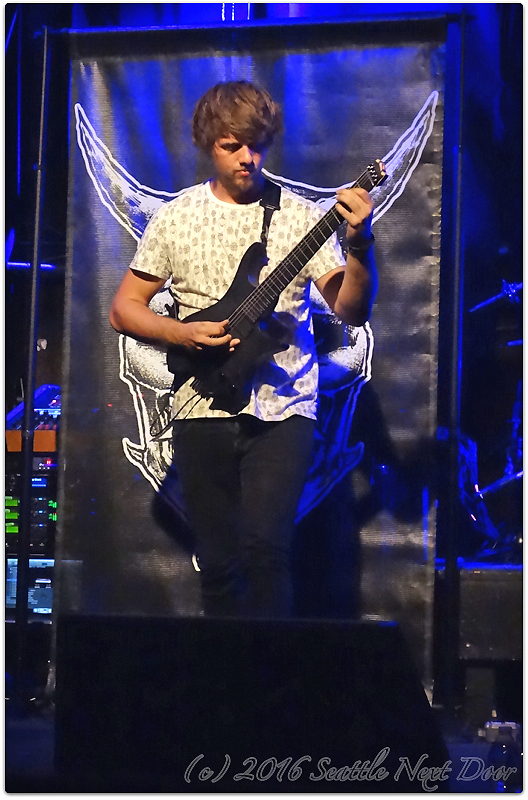 For example - the solo in "Queen Of The Reich" - Parker could nail that. Ditto the intro to "Take Hold Of The Flame" - let Parker play that as DeGarmo originally did it. Yes, I'm nitpicking. I understand when the previous guitarists may not have been up to snuff or what have you. Again, that's not the case now. The band used to be five strong. They are five strong now with guitar parts not evenly distributed. I'd love to see that go back to more of a 50/50 split in the future between Whip and Parker. Just my opinion. Eddie and Scott - what can you say? They are one of the most underrated rhythm sections in all of music. Musician's musicians, you know? Great stuff! I left the venue feeling very satisfied. The band has a short break to rehearse more new tunes before they head back out on the road in the second half of April and beyond. The band's future is bright. I can proudly say I'm a Queensryche fan once again! Thanks to: David at Concrete for the opportunity and to Fozzy for being a professional about the guest list and band video interview details! "I'm a songwriter". This is what Beauty In The Suffering (BITS from here on) founder DieTrich Thrall told me in early March as he was waiting to take the stage later in the night with Kill Ritual - a metal band he was touring with at the time as a touring bassist. "The Crazies" EP is a mixture of tunes that have been recorded over the last few years. Three original tunes with one cover tune. The Outfield's, "Your Love". The EP starts off with "The Crazies" (The Zombie Song). With an eye-catching video to boot, this song is infectious (pun intended). While I'm by no means an expert when it comes to this type of industrial rock/metal music, the layers of instrumentation point to a creative songwriter that knows how to craft a tune. This tune could easily be included on a soundtrack to a major motion picture. Next up is "Reveille" (The Zombie Charge). This is another catchy tune with a driving landscape of instrumentation. I get the feeling that DieTrich may have spent many of his formative years channeling many different musical influences into what eventually became BITS. "Juliet" is track three. The opening few bars lead right into yet another catchy, industrially driven tune. The mixture of musical styles within the layers of these tunes is really inspired. The casual listener would dismiss this as basic industrial music. Nope. Not even close. Listen to the tunes repeatedly and you'll feel them unravel and work their way into your musical psyche like only quality music can. Great stuff! The last track has been making the round on the 'Net. My own little music duo has covered this tune recently as well. I was told that this is one of many cover tunes that may see the light of day that BITS recorded. A catchy tune from the 80's, "Your Love" gets the BITS treatment here. I find the instrumentation a little more like a demo. Just a little bit like a demo version. Meaning that perhaps the track could surface in a new version that is more layered like the other three tunes on the EP. Don't get me wrong - it's still very well done! Overall, this EP is exactly that - an extended play release. Having seen DieTrich with Doyle and Kill Ritual, I think it's time to see him in his own element - Beauty In The Suffering! I hope this EP is a teaser to a full-length album and tour this year! Thanks to: DieTrich Thrall for the advance of the release!